A hot tub is a big investment. You definitely want to get the best one for your money. You can’t go wrong with the best Lifesmart hot tubs. Lifesmart is a reputable company renowned for high quality, attractive, and luxurious spas. Many people consider them the best hot tubs on the market. 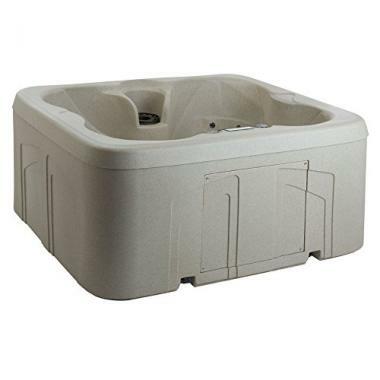 Featuring rotational molded rock solid outer shells that are virtually indestructible, the build quality of their hot tubs is truly rock solid. Their Eco Smart technology is so energy efficient that it exceeds the California Energy Mandate for hot tubs. Pricewise, their spas are incredible deals that offer a lot for the money. Below, we’ve reviewed their two most remarkable home spas. We also have a buying guide to help you pick the right Lifesmart spa for you. Let’s start with the top two picks. As its name suggests, the Lifesmart Rock Solid Simplicity hot tub has rock-solid build quality and a simple setup. It features a highly indestructible sandstone RockSolid shell and surround. Lifesmart hot tub reviews by owners show that it lasts for years without issues. Being a Lifesmart plug and play model, the Rock Solid Simplicity is the easiest to install. Just fill it up with water, add spa chemicals and plug it into a dedicated 110v electrical outlet. It can be moved easily by two people so you can use it both indoors and outdoors. It will look good wherever. According to Lifesmart hot tub reviews by actual users, it takes up to 24 hours to warm up to 104 degrees and the spa maintains this temperature very well. The Balboa digital hot tub control panel is easy to understand. It has four deep bucket seats to accommodate four people but it is a bit on the small side for 4 adults. It's ideal for 2 to 3 adults, or 2 adults and 2 kids. The 13 powerful hydrotherapy jets are adequate for its capacity. You can direct them as you please or turn off some of them so the remaining ones are even more powerful. Using the comfort valves, you can add heated air to the water to enhance the experience. It has a 1.5 horsepower friction pump. The Lifesmart Rock Solid Simplicity comes with a strong thick cover with safety locks. You will have to drill holes into the spa to attach the cover straps. With the full foam insulation and well-insulated cover, you can enjoy soaks as often as every day without your electricity bill shooting to the roof. Don't want to run it in the winter? Just set it to run idle. 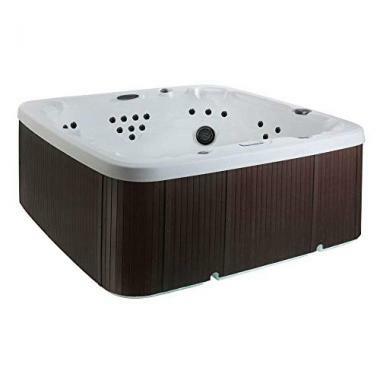 This luxurious and fuss-free hot tub also comes with a 12-volt spa light with red and blue lens caps and an adjustable waterfall. Since it has a top loading filter, you don't have to drain the spa in order to inspect, clean or replace it. It is also equipped with an ozonator that reduces hot tub chemical usage. The LifeSmart 600DX is a high quality and beautiful hot tub. It is the perfect addition to a deck, patio, or backyard. Those who already own this top rated Lifesmart spa rave about its quality, good looks, and value for money. The rotational molded rock solid shell is virtually indestructible. While the stated seven adults would be really cramped in there, it is spacious enough for four or five people to soak comfortably. This spa is not a plug and play model. You will need an electrician to connect it for you. It requires a 220 Volt 40 Amp breaker. With 65 full therapy rotating jets, footwell jets, and a multi-jet turbo blaster, this Lifesmart 7 person hot tub gives a full body massage. Using the comfort valves, you can add warm air to the water. It has a circulation pump that is very quiet. The downside here is that only the jets on the two opposite seats work on high simultaneously. Featuring Lifesmart's Eco Smart energy management system, this hot tub is well insulated and highly efficient. You can also winterize it to save energy. The limited period free energy saving package includes a 3-inch- locking cover, full foam insulation, the ozone system, stainless steel jets, and LED color lighting. The lights have an interchangeable mood lens caps so you can add your favorite color lens cap to create the ambiance you want. The LifeSmart 600DX also features Balboa topside controls and a waterfall jet. Matching steps are available for purchase separately. The easy to access and clean top-loading filter and ozone system simplifies its maintenance. If you want something sturdier than an inflatable hot tub but still want an easy setup experience, Lifesmart plug and play models such as the Lifesmart rock solid simplicity and Lifesmart Luna spa are the easiest to install. No assembly is required. Just set it up where you want, fill it up with water, add the chemicals, and plug it into a dedicated outlet. If you opt for the 600DX, you will need to hire an electrician to connect it for you. There are Lifesmart 4 person hot tubs, Lifesmart 7 person hot tubs and so on. This stated capacity is usually true only if the users sit really cramped. Since more room when hot tubbing is always better, it is a good idea to choose a spa with a higher seating capacity than you need to ensure users will sit comfortably with room to relax and stretch their legs. Also, consider the maintenance requirements. The best Lifesmart spas are easy maintenance, as they are equipped with the ozone water treatment system,which reduces the number of chemical treatments required. Anything that ups the comfort, convenience, fun, and relaxation a hot tub offers is a plus. The more hot tub accessories a hot tub included, the higher its value for money. Lifesmart hot tubs come with a well-insulated cover, the ozone system and LED ambiance lights. Also, check whether the hot tub will offer the health benefits you’re after. Lifesmart hot tubs provide hydrotherapy and massage therapy. They are great for relaxation and relieving aches and pains. Before you make your pick, think about where to put a hot tub. When evaluating different hot tubs, check the physical dimensions and whether they suit the space available. If you have limited space, you will need to get a compact model. If you want a versatile home spa you can set up indoors and outdoors, look for a portable model that can be easily moved. Hot tubs come in a variety of shapes. What shape to go for is not just a matter of personal preference. It will also be dictated by where you plan to set up the hot tub. If it is a corner indoors, a triangle-shaped hot tub would be ideal. For an outdoor setup, you can opt for a large rectangular hot tub. Jets are a fundamental part of a hot tub. A hot tub equipped with a high number of powerful jets delivers a great hot tubbing experience. The ability to adjust and direct the jet streams is also important. The best Lifesmart hot tubs also feature topside comfort valves for adding warm air to the water. Lifesmart hot tubs have all the standard features you can expect in any top of the range hot tub such as Balboa digital controls, LED mood lighting, waterfall feature, and the ozone water treatment system. In addition, the rotational molded rock solid outer shell is virtually indestructible and outlasts standard acrylic spas. Lifesmart Eco Smart technology is highly energy efficient thanks to full-foam insulation and an insulated cover. The rock solid outer surface Lifesmart hot tubs feature cleans easily. It is easy to clean the hot tub filter since it is top loading and there is no need to flush the water out of the spa first. The built-in ozonator keeps the hot tub clean and thus reduces the cleaning frequency. The pump is another crucial component of a hot tub. It ensures there’s regular water flow so the jets can deliver powerful massaging streams. It also ensures the water is evenly distributed for heating. If you want a large spa, choose one with multiple pumps to get good jets water pressure. For a relaxing experience, a quiet spa pump is best. Lights add a nice ambiance that enhances the spa experience. Lifesmart spas are equipped with LED lighting systems. The Rock Solid Simplicity offers red and blue lens caps while the Rock Solid 600DX comes with a spa light with interchangeable mood lens caps so you can install your favorite hue. Q: Why Choose LifeSmart Hot Tub Over Other Hot Tubs? A: Quality and durability, good looks, energy efficiency, ease of installation, and great value for money. The best Lifesmart spas have got it all. Their rotational molded rock solid outer shells last a lifetime with proper care. Lifesmart plug and play spa models are the easiest to install. Their Eco Smart technology is one of the most efficient hot tub energy management systems available. And if you encounter a problem, Lifesmart’s customer care is top-notch. Q: Can I Set Up My LifeSmart Hot Tub On My Own Or I Need A Professional To Do That For Me? A: If you get a Lifesmart plug and play model, you can set it up on your own. Just place it where you want, fill it up with water, add spa chemicals, plug it into its electric outlet. With other models such as the 600DX, you will need a professional electrician to set it up for you initially. Q: What Other Accessories Will I Need For My LifeSmart Hot Tub? A: You will need a number of accessories to enhance the functioning and life of your Lifesmart hot tub. Lifesmart spas come with a hot tub cover, a top loading filter, and a hot tub ozonator. Other accessories you will need for your Lifesmart home spa include hot tub chemicals to keep the water crystal clear and healthy, hot tub steps for getting in and out, a hot tub drink holder, a hot tub cover lifter, a hot tub gazebo or enclosure for shade and privacy, and a hot tub cleaner . Nothing relaxes your body, mind, and soul better than a soak in a hot tub. When forking out thousands of dollars to invest in a hot tub, you want to make sure you make the right choice and get the best value for your money. We can assure you that a best Lifesmart hot tub is a solid investment you will enjoy for years. How about you? Which Lifesmart spa is your personal favorite, even if it isn’t included in our Lifesmart hot tub reviews? Let us know your thoughts and experiences in the comment box below!